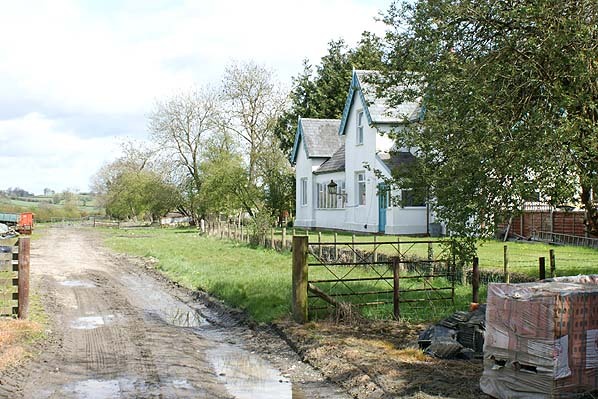 Notes: Kerry was the southern terminus of the 3¾ mile Kerry Branch railway which was opened by the Oswestry & Newtown Railway (O&NR) on 2 March 1863. The branch connected to the O&NR main line at Abermule. John Wilkes Poundley had been building up a trade in what became the famous Kerry breed of sheep and he sought a rail link to Kerry so that he could expand his business. The branch was authorised on 17 May 1861. Passenger services began first with goods trains following on 1 July 1863. Kerry station was actually located in Glanmule a mile to the east of the village of Kerry. It was within the fork of the Kerry and Sarn road (the A489) and the Abermule road (B4368) to the west of the Afon Miwl. The branch was single track and the station had only a single platform located on the south side of the line. 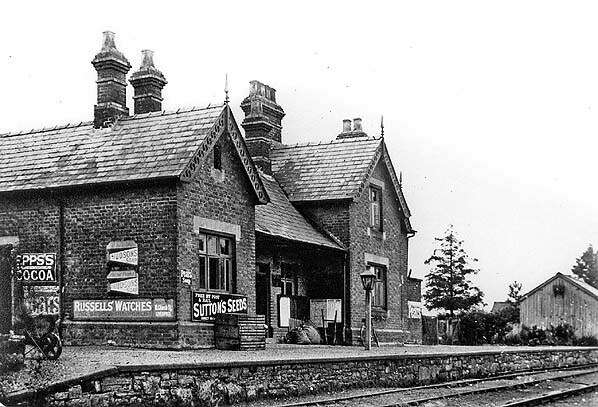 It was provided with an attractive cottage ornée building consisting of a two-storey station house and contiguous single-storey office range. The gables were adorned with pierced bargeboards. At the west end of the platform there was a turntable. The station also had goods facilities located on the north side of the branch which included two sidings, a goods shed and a loading ramp. There was also an engine shed on east side of the site. At the time of opening the trains between Kerry and Abermule were worked by Sharp Stewart 0-4-0 Saddle Tank locomotives No.36 Plasfnnon, No.37 Mountaineer and No.38 Prometheus, all of which were shedded at Kerry. The trains became affectionately known as The Kerry Express and usually consisted of a 1st/3rd class coach, which had ‘Kerry Branch’ emblazoned on the side, and some wagons. It took 25 minutes to complete a journey between Kerry and Abermule. On 25 July 1864 the O&NR joined with a number of other companies to form the Cambrian Railway (CR). In 1887 a 2ft gauge tramway was opened between Kerry station and the Brynllywarch estate which was owned by Christopher Naylor. 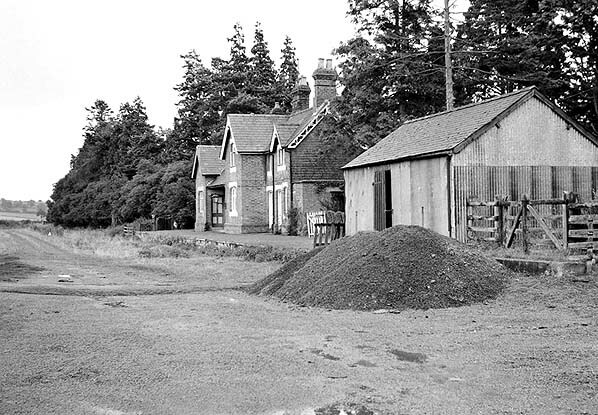 The line served the timber forests on the estate, as well as a slab quarry; it also handled general estate traffic. Transhipment facilities were developed at Kerry station so that materials could be easily transferred between the tramway and the railway. The tramway closed in 1895 and it was lifted shortly after. The December 1895 timetable showed four departures and arrivals on Tuesday-to-Friday. On Monday (Welshpool Market Day) and Saturday there was an extra train in each direction. 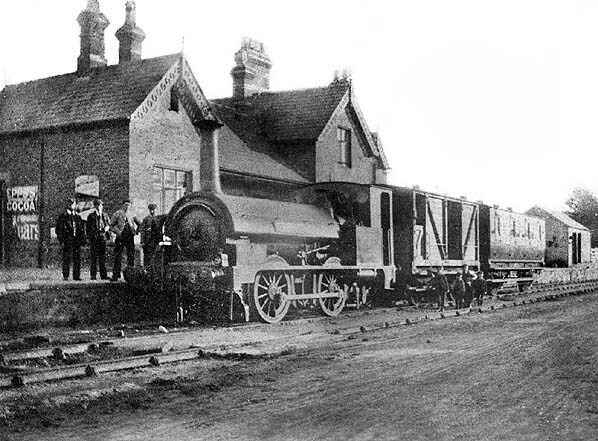 By 1903 the station had gained a weighing machine, a crane and an additional goods shed. By 1907 the three Sharp Stewart locomotives of 1863 vintage had been withdrawn and the line was generally worked by one locomotive. During the First World War there was a great demand for timber. In 1917 the government Timber Supply Department (which later became the Forestry Commission) re-laid much of the tramway to serve a saw mill on the Brynllywarch estate. The tramway and timber-felling operations were mainly manned by German prisoners of war under military control. During the war, the line was worked by the Kerr Stuart locomotive Diana. After hostilities ceased the tramway continued to operate. Due to coal shortages an emergency timetable was introduced on 5 May 1921 which reduced the service to Tuesdays only. On 1 January 1922 Kerry station became part of the Great Western Railway (GWR). The July 1922 timetable showed one departure on Monday, Thursday and Friday. There were two trains to Abermule on Tuesday, Wednesday and Saturday. There was only one arrival from Abermule on Monday, Tuesday, Thursday and Friday. On Wednesday and Saturday there were two trains from Abermule. There were no trains on Sunday. On 9 July 1923 the GWR opened halts on the branch at Ffronfraith and Goitre. They operated the line using former CR 0-6-0 and 2-4-0 tank engines. The Kerry tramway closed in 1925 (sections of it having already gone out of use in 1922) and once again the track was lifted. By 1930 there were only a few passenger trains in each direction on Monday-to-Saturday which led to the GWR withdrawing the service completely on 9 February 1931. Sunday school excursion trains continued to run until 1939. Goods services continued to operate on the branch which became part of British Railways [Western Region] (BR[WR]) on 1 January 1948. 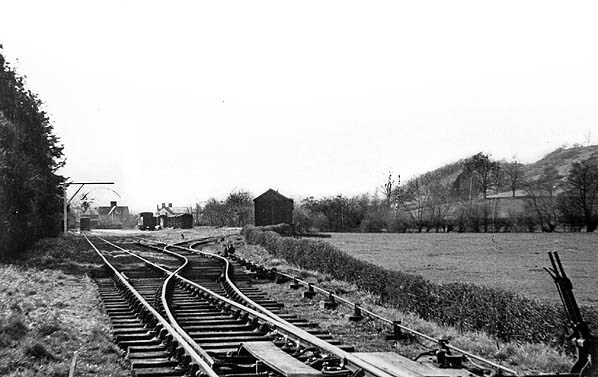 Goods services were withdrawn on 1 May 1956 and the track was lifted by the end of 1959. In 2016 the station building was in use as a private residence. a goods office and the engine shed were also still standing. Kerry station looking south-west in the early 1900s. Although devoid of passengers in this view the station was a busy place at this time for goods as indicated by the crates and sacks that can be seen on the platform. 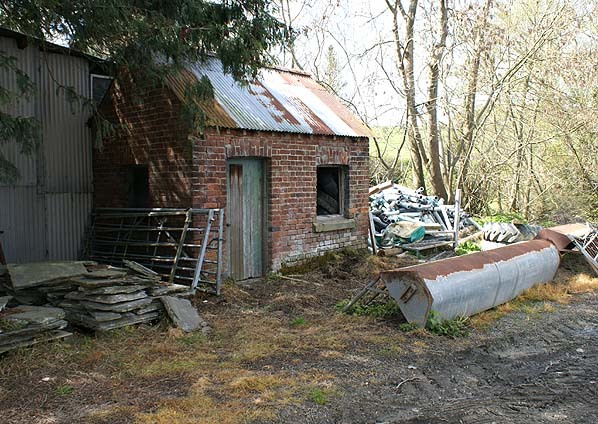 To the right can be seen the storage shed which was used for the storage of dry goods and perishable items. Kerry station shown on a six-inch scale map from 1884. Kerry station shown on a six-inch scale map from 1949 during the period when it was a goods station. The passenger service that ran between Kerry and Abermule was known locally as ‘The Kerry Express’ a tongue-in-cheek description for a very local service that ran at low speed. The ‘Kerry Express’ is seen in this view from the early 1900s at Kerry station. Railway staff and some young boys have gathered to pose for the photographer. 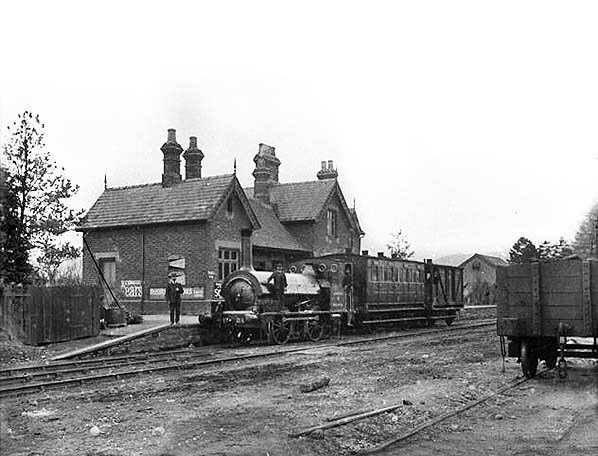 The ‘Kerry Express’ often ran as a mixed train as seen in this view looking west from the Kerry station platform in the early 1900s. At the head of the train is Cambrian Railways 0-4-0 locomotive number 36 'Plaseyfynnon'. Behind the engine is a four wheeled Cambrian Railway coach of nineteenth century vintage followed by three wagons and a brake van. The train is standing on the run around loop and to its right a wagon can be seen in the goods yard. 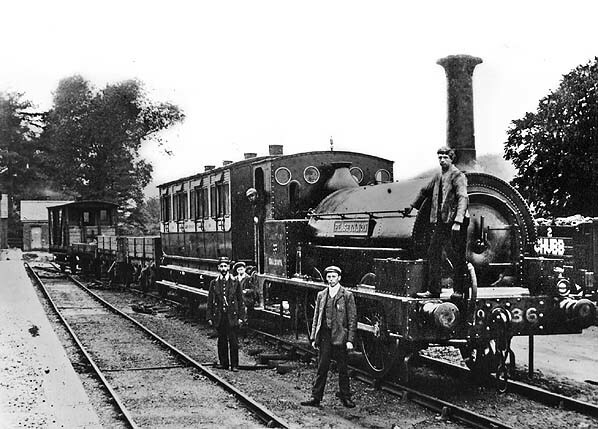 The locomotive crew, guard and other railway workers are seen posing by the train. A view looking south-west at Kerry station in the early 1900s. Standing at the platform is the train that ran between Abermule and Kerry and which was unofficially known as 'The Kerry Express'. Kerry station looking west in 1949. The passenger platform was in the distance to the left. The station sidings can be seen to the right. 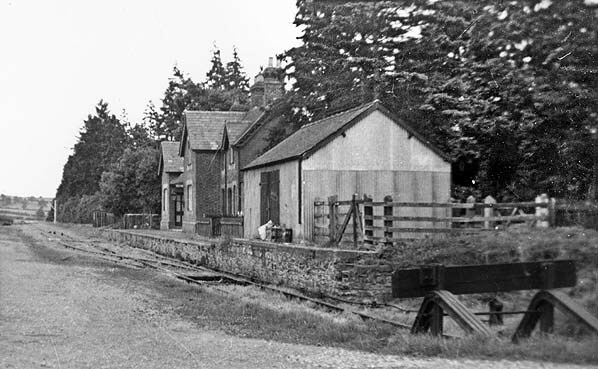 A view of Kerry station looking east in 1955. Looking east at Kerry station in the early 1970s. The Kerry station goods office seen on 3 May 2016. Kerry station looking east on 3 May 2016.